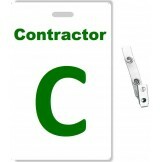 Custom Printed PVC Contractor Badges + Strap Clips 10 pack Pack Includes ;- 10 PVC Cards /w slot.. 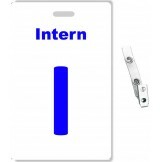 Custom Printed PVC Intern Badges + Strap Clips 10 pack Pack Includes ;- 10 PVC Cards /w slot hol.. 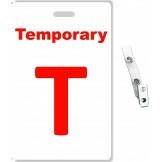 Custom Printed PVC Temporary Badges + Strap Clips 10 pack Pack Includes ;- 10 PVC Cards /w slot .. 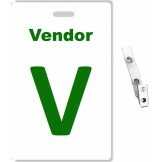 Custom Printed PVC Vendor Badges + Strap Clips 10 pack Pack Includes ;- 10 PVC Cards /w slot hol.. 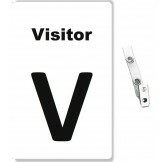 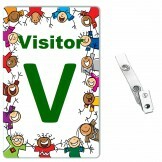 Custom Printed PVC Visitor Badges + Strap Clips 10 pack Pack Includes ;- 10 PVC Cards /w slot ho.. Custom Printed PVC Volunteer Badges + Strap Clips 10 pack Pack Includes ;- 10 PVC Cards /w slot ..
White PVC Kids Theme Badge with Clear Vinyl 2 Hole Strap Clip - 10 Pcs Pack Pack Includes ;- 10 ..